Price reductions continue across the board, as I learn that Giulio Riggio in the Palma office of Fraser Yachts has seen a pretty hefty reduction in the price of his central agency, Benetti's 39m Desamis B. Built in 1994 to Bureau Veritas class and MCA compliant, she sleeps 10 guests in a master, two doubles and two twins and has a range of 3,200 nautical miles at 12 knots. 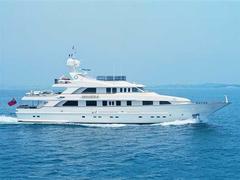 Formerly on the market at €9.9 million, she's now asking €7.9 million.